Quito and Guayaquil both have international airports. Most visitors fly in and out of the capital, Quito, which has flights from the United States on American, British Airways, Continental, KLM, Lufthansa, and United Airlines. The phone numbers and Web links for these airlines can be found at this magazine's Airlines page. Visitors to Quito will not need a car within the city, as taxis are widely available and the pricing is reasonable. 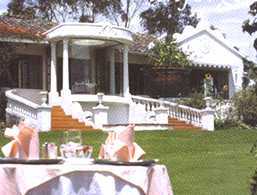 Visitors to the Ecuador Highlands, such as Imbabura Province to the north, have the option of arranging for a driving service if they are staying at one of the haciendas (below), or they may opt to rent a car. All of the major U.S. rental agencies are represented in Quito. Phone numbers and Web links for these auto rental companies can be found at this magazine's Autos page. Ecuador utilizes the U.S. dollar as its currency. Most hotels and restaurants take credit cards, but be sure to carry traveler checks and cash. Watch your belongings at all times while traveling. Courtesy: Mountain Travel Sobek Visitors to the Galapagos Islands generally charter a guided trip. 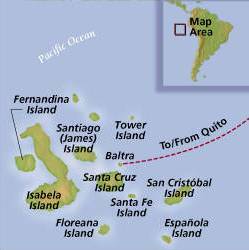 Flights to the Galapagos are then booked by the charter company on the Ecuador air carrier, TAME, with a separate fee for these roundtrips from Quito via Guayaquil. Since access to the Galapagos National Park is limited (only four islands have human settlement), the best way to see the broad array of what the islands have to offer is via a small boat charter. We researched the alternatives through a guide book and the iExplore.com Web site (below). We decided that Mountain Travel Sobek offered the best combination for our preferences. The incredible itinerary covered 600 nautical miles (traveling primarily at night) and hit nine islands and several islets, with daily hiking and snorkeling, along with optional kayaking. Our guide, Carlos King, was extremely knowledgeable, fun-loving, and understanding of his clients' needs, while the crew and accommodations were top-notch. Our recommended guidebook is Ecuador & Galapagos Islands Guide, by Becky Youman and Bryan Estep, 2000. Charles Darwin's Voyage of the Beagle is also recommended to get into the spirit for the trip. Spanish is Ecuador's official language. The indigenous Otavlian tribe of Imbabura Province speaks their own Quichua language. The Otavalian vendors and craftspeople speak enough Spanish and English phrases to be able to barter with their clients in the marketplaces. With an average elevation close to 10,000 feet altitude at the Equator, the average days are moderate (75 degrees F) and the nights can be cool. The Pan American Highway is a two-lane road which connects the major towns and most of the villages in Imbabura Province. If you are up for a splurge, it is recommended to base your visit to Imbabura Province from one of the hacienda hosterias in the countryside, close to the array of Indian villages. We chose Hosteria La Mirage and were overjoyed with the ambiance, service, and surroundings. We booked a three-night/four-day package which included a guided drive and visit to the villages on the trip from and back to Quito. Walking, bicycling, and taxis were available from the establishment. The booking agency in the U.S. for Hosteria La Mirage is L.A.R.C., 1-800-327-3573. Our recommended Guidebook is Ecuador & Galapagos Islands Guide, by Becky Youman and Bryan Estep, 2000, which includes many lodging, dining, and activity recommendations. Return to Galapagos and Ecuador Highlands article.